For more than 1000 years, this has been a place of worship. Shintu Buddhists have come to Mt Takao, just east of Tokyo, to pray for good fortune to the gods. They still do. A group in front of me huddles together, bowing in sync with their chant. But around them are Japanese hikers, fully kitted out with walking boots, backpacks and gaiters, tiny tot school groups, fit oldies stoically tackling the inclines and families on a day out. Tourists are noticeably missing. Well, except me, of course. Mt Takao is just under an hour on the Keio Line from the Shinjuku Station in Tokyo. Tickets are easy to buy on the touchscreens and each costs 390 yen ($4.50). With Yuji Dave Otsuka alongside, we spill out from central Tokyo into the suburbs, as passengers dwindle. By the time we reach Takaosanguchi railway station, we are among the few heading for Mt Takao. The village at the bottom of the 599m mountain is picture perfect on this autumn morning, with a stream running and the trees changing colour. The queue for the cable looks long but, as I have come to expect of Japanese queues, people stand politely and placidly and we are surprisingly quick. The cable car is also owned by Keio and can be combined in one ticket. Mt Takao is in the Meiji no Mori Takao Quasi National Park, with lots of walking paths, the main ones sealed. The pleasure is not only visiting the mountain’s main shrine, achieving the 599m summit (along with all those little tackers) and maybe getting a glimpse of Mt Fuji (but not today), but also being with locals on their day out. We pass a row of big cedar trees, the tallest 47m, which, a sign says, survived the “26th Typhoon” in 1966. There are statues of tengu — somewhat mischievous mountain gods. One has a long nose; another a crow’s beak. And, in a surprise moment, Yuji shows me the recognition of his grandfather’s donation to the temple, which was established in the year 744. For this temple is connected to one in his hometown. Our day has a personal dimension. Walking back down Mt Takao. Cable car up Mt Takao. View towards Tokyo from Mt Takao. Yuji Dave Otsuka with the recognition of his grandfather’s donation to the temple. The main temple at Mt Takao. Buddhists chanting at the main temple. While others picnic, Yuji has already booked lunch for us at the Buddhist monastery, and we sit picking through the vegetarian dishes with chopsticks. Rather than ride, we walk for less than an hour back down the mountain, enjoying the clear air and autumnal colours. Then we get on the Keio line train to Tokyo, but get off again in the Chofu area to visit Jindaiji Temple, a 10-minute taxi ride from the station. Chofu is a just what we visitors like, with small, pedestrianised streets, nice little shops and places to eat. The temple, which dates back to the year 733, is the second oldest in the Tokyo area. 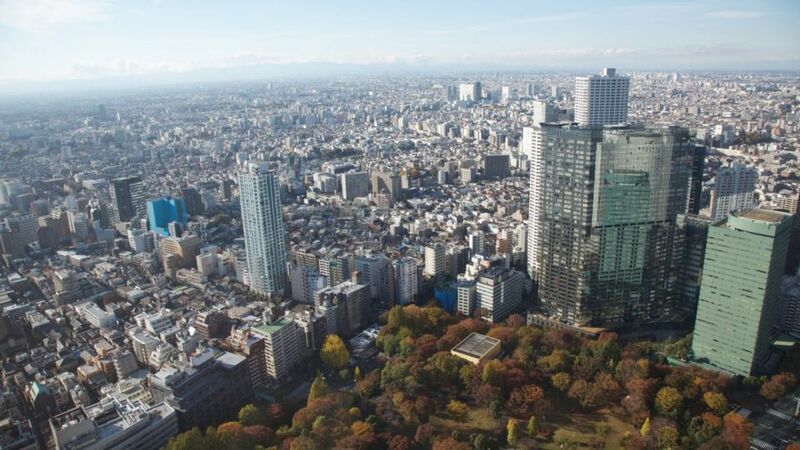 In the same precinct is the Jindai Botanical Garden — the first botanical garden in Tokyo, with 100,000 trees and shrubs. In front of the temple, with its water garden, I get completely lost, looking through my camera’s viewfinder, capturing autumn’s colours.